India is a country located in the South Asia. It is the seventh largest country in area. It shares its boundaries with Pakistan, Bhutan, China, Nepal, Bangladesh & Myanmar. India has 29 states & 7 union territories which are controlled & ruled by the central government. The higher education system of India is counted as the third largest education system in the world. India is a hub of top engineering colleges/universities which imparts top quality education in various specializations of engineering. The most top rated institutions are Indian Institute of Technology (IITs), National Institute of Technology (NITs), Indian Institute of Information & Technology (IIITs), etc. According to the census 2011, the average literacy rate of India is 74.04%. In this article, we are providing complete details about Top Engineering Colleges in India 2019. 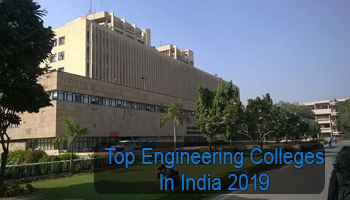 For the academic year 2019-20, we have listed, the list of top engineering colleges in India, which offer undergraduate & postgraduate courses in engineering, applied engineering and sciences. The list includes NITs, IITs, IIITs, governments and other public & private technical universities. The admission to the engineering courses in India will be done on the basis of national, state & university level examination. JEE Main is a national level exam conducted for providing admission to the B.Tech & B.Arch courses. This exam is managed by the NTA through online mode. Some states will also organize their state level entrance test to get admission into these courses. These exams are AP EAMCET (Andhra Pradesh State), Assam CEE (Assam State), BCECE (Bihar State), JEECE (Jharkhand State), JKCET (Jammu & Kashmir state), etc. There are also so many universities which conduct its own admission test for admission to the UG engineering programme. The admission to the IITs will be based on JEE Advanced after qualifying JEE Main. For admission to the M.Tech programme, students have to pass the GATE exam. In India, the engineering course is one of the preferred choices for students after qualifying 10+2 level examination. There are various specializations which are offered in the field of engineering. Some of the top engineering disciplines are Computer Science & Engineering, Information Technology, Civil Engineering, Mechanical Engineering, Electronics & Communication Engineering, Automobile Engineering, Electrical Engineering, Aeronautical Engineering, etc. If you have any other queries about Top Engineering Colleges in India 2019, you can leave your comments in the comment box given below. I want to take admission in Btech computer science,please guide me, would be better c v Raman engineering college bhubneswar odisa. Sir, I have got 73.25% in 12th board exam with PCM along with computer .Which college will best for me ? sir,I want to admission in best engineering course.please guide me. which collage is better for me govt or private? There are 3 types of colleges based on fundings. IIT should be your first aim.ELSE…. I prefer Government aided or Private college rather than Government college. which is the best college for Engineering & Technology? There is no IIIT in the list why? sir , i am studying in 12th now, i like chemistry subject and i want to do chemical engineering so pls advice me. Well in my view both subject have good scope. In today’s generation IT sector is on trend but in chemical engineering there are less engineers. So you can go for any stream according to your love towards your subject. Which are the best colleges for petroleum engineering? i am studying inter second year.i would like to take aero space engineering so which would be better? it is good stream. However, it depend upon your entrance exam marks.